In Part 1, we looked at some creative vertical structures to help you grow plants ‘up’ and save space in your garden. This post inspires you with more ideas on how to use two other types of vertical structures – ones to grow down and stackable systems. 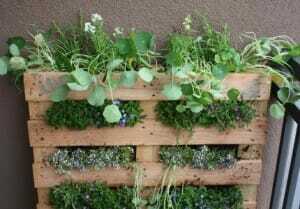 Try upcycling a pallet to make your own vertical garden. Fern from Life on the Balcony converted a pallet into an edible micro garden. 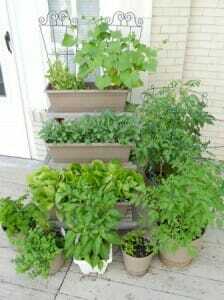 A clever example of a stackable vertical garden for a narrow space. Click the photo to find out how to make your own. These vertical garden structures make the most of ‘aerial space.’ They are ideal for those living in apartments or where a ceiling, fence or railing can be utilised to make the most of the overhanging space. 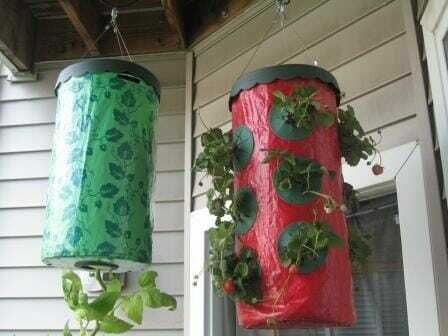 Use hooks and brackets to mount these vertical garden systems but make sure you check the strength of the support structure first and the weight limit for the hooks. 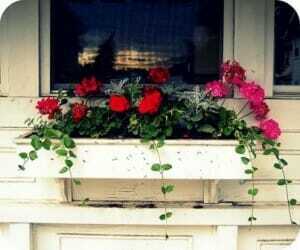 Window boxes can be attached to structural framework to take the additional weight of soil and plants. Cascading foliage and flowers softens and brightens this space, bringing the outdoors in with a pretty view. 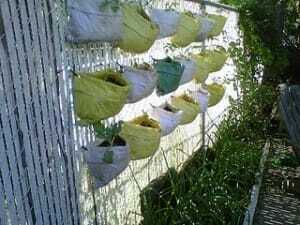 Upside down grow bags (also known as Topsy-Turvy planters) – eliminate the need to weed or stake plants like tomatoes and are a good solution for those with poor (or no) soil or very limited space. Low cost topsy-turvy upside down planter bags are a popular choice with many gardeners to grow strawberries or vegies like tomatoes. A number of strawberry plants are stacked in the one planter. 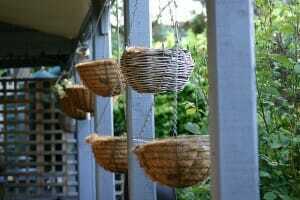 Hanging baskets – can be positioned at different levels or hung in tiers and make excellent use of aerial space. Can be used as a vertical screen to increase privacy, add shade and colour. Tiered hanging baskets increase the quantity of plants you can grow in an otherwise unplantable area. Even if you have no soil or an in-ground garden, you can still grow vertically in baskets! 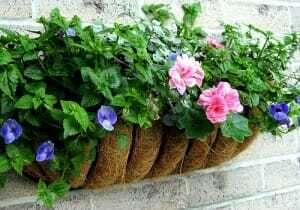 Wall mounted metal planter with a moisture holding coir base filled with colour. 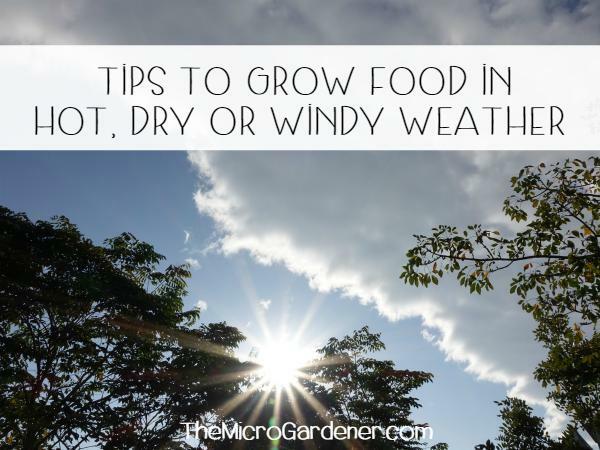 Got some leftover organic fertiliser or compost bags? Why not repurpose them into garden planters and mount them on a wall or fence with grommets on each corner? Deck or balcony railing planters – available in a variety of sizes and styles that either sit on top of the railing or rest in brackets mounted on railings. They increase your planting area along the length or in corners of decks or balconies. Some railing planters are intended to hold pots, while others can be planted directly and planter styles include straight, corner and even stacking shapes. Available in a wide variety of materials including wood, resin, fiberglass and metals in different widths and lengths. They are ideal for low and trailing plants and can add height to railings for privacy. 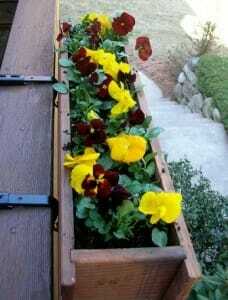 Planters can be attached to railings or ledges with brackets like this colourful timber display box of pansies. It is well supported and lightweight even when planted. Positioned near the entrance stairs, it’s an eye catching welcome. 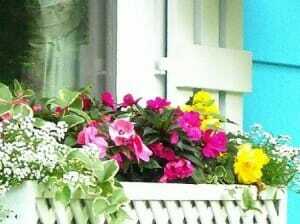 Window boxes – although originally designed to sit on a windowsill with plants cascading down, they can also be attached to the wall below a window or hung off balcony railings. 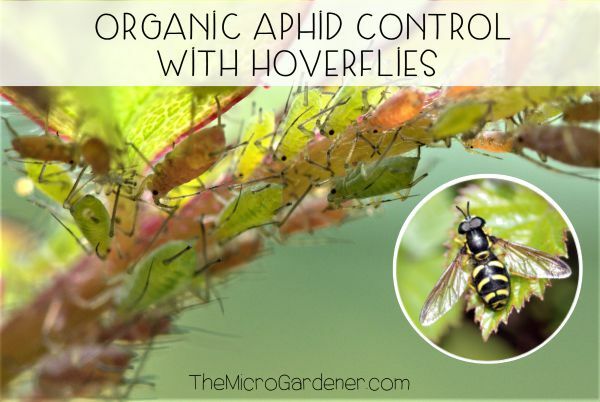 One of the benefits is the convenience of reaching out to harvest fragrant edible herbs or an eye feast of colourful flowers from indoors. 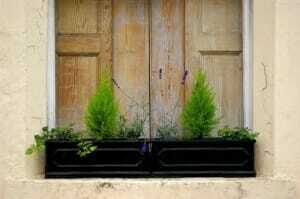 Planters can be positioned on a window ledge like this one, with quaint shutters. Great use of contrasting colours really brightens up this space. You can imitate nature where you find understories and canopies and plants that grow in nooks and crannies, by taking a layered approach to maximise vertical growing space. 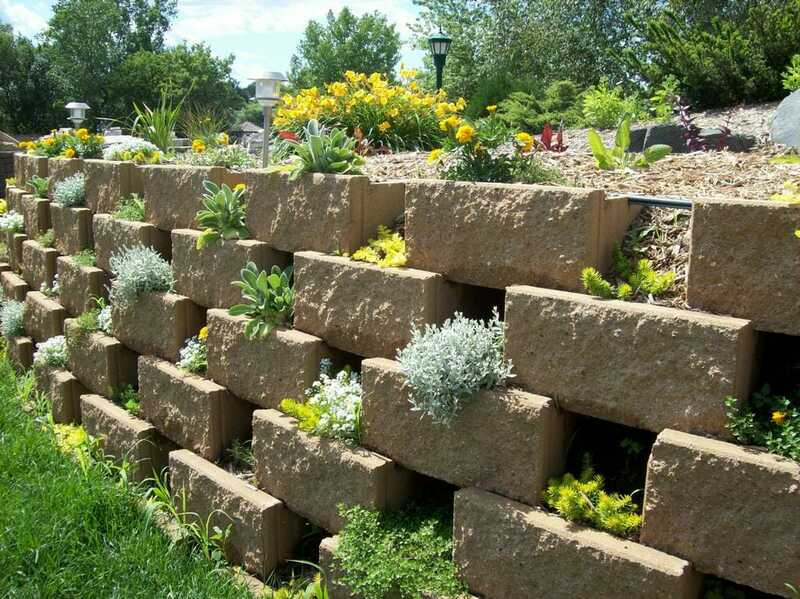 Take advantage of any stackable space – this interlocking block wall on a boundary had tiered spaces just crying out to be planted! Multi-tiered shelving – all sorts of furniture items have suitable shelves or you can make your own. Repurposed furniture like shelves, bookcases and a chest of drawers can all make great vertical gardens if they have adequate drainage. The ability to stack pot plants on tiered shelves makes maximum use of a small space. Tiered stackable planter systems like this Stack-A-Pot with a self-watering system and drip tray are neat self-contained mini gardens. 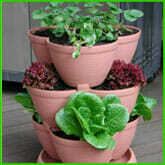 Stackable planters like these come in different sizes and colours, are stand-alone or can be hung on a hook. 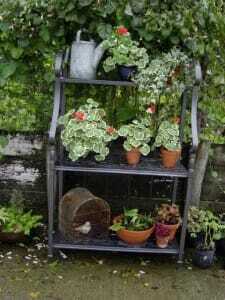 Add an inexpensive trolley with castors and you have a portable garden. This vertical pot plant tower is a real eye catching feature as well as being a practical stacking vertical garden system! Best of all it takes up minimum space. Greenhouses and shade houses with shelves are a tiered growing system. Many are now small enough to fit on a balcony. 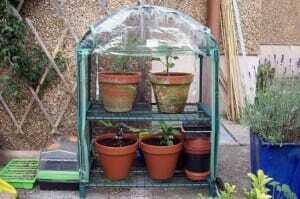 In compact spaces, a mini greenhouse like this with shelves opens up the possibilities with what you can grow vertically and through the seasons when the weather may be against you. Planter boxes – available in a variety of sizes, they can be positioned in tiers to maximise a tiny space like a balcony or verandah. These tiered planter boxes are well designed for maximum growing space. Teamed with mini trellises for climbing vegies & a caged tomato to grow an incredible quantity of edibles in a tiny space. 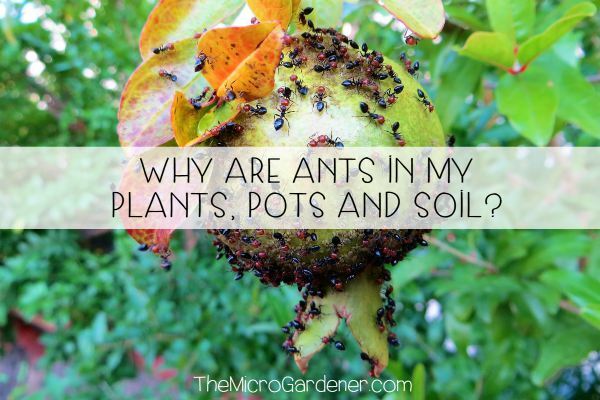 These are highly productive micro gardens! Strawberry and herb pots with multiple planting holes make practical micro gardens, maximising use of vertical space even in a container. 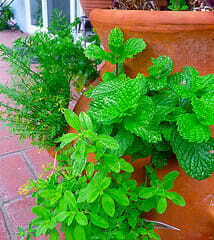 Small planting pockets around the sides of the clay pot are perfect for shallow rooted plants like herbs, strawberries and flowers. More water-loving plants can be positioned at the bottom with those that like dry feet at the top. Raised garden beds – a popular choice in many small gardens – particularly those that have no or poor soil, raised beds can also be terraced to stack one space on top of another, maximising the growing area. This vertical solution also suits sloping gardens which naturally lend themselves to terracing with raised beds. With pavers or stepping stones in between for access, this opens up the possibilities to what you can grow! What incredible edibles! 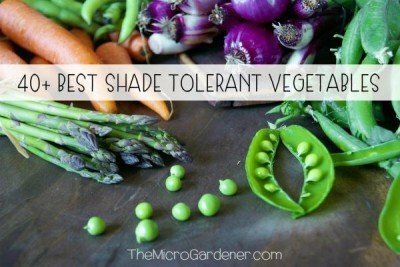 These vegies look almost too good to eat! These tiered raised kitchen garden beds are both beautiful and space saving. This garden has multiple vertical elements to maximise space! Tiered raised bed gardens with compartments and tepees are clever ideas for this space. Ladders and plant stands – with a little imagination, you can create plant stands with anything that has steps. 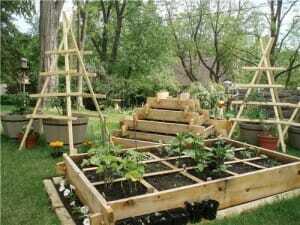 Ladders, step ladders and plant stands all make great garden features as well as vertical structures to put your plants on. 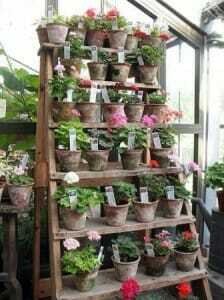 Here a collection of geraniums is showcased with great effect. 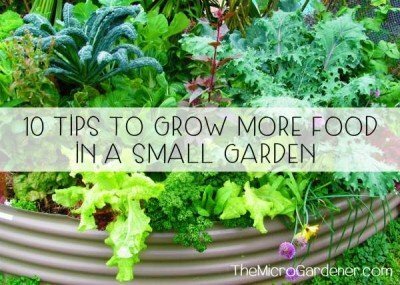 Want more space saving garden ideas? If you missed it, read Add Space with Creative Vertical Gardens: Part 1; 12 Reasons Why You Should Garden Vertically and 15 Helpful Design Tips for Vertical Gardens. 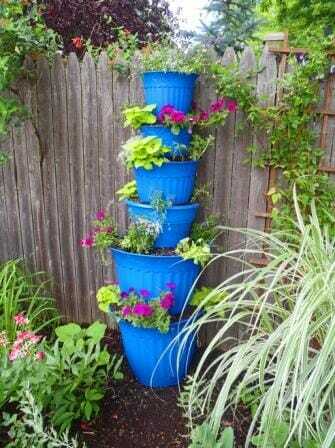 You can find more Clever Design Ideas in the Container Gardening category. Did you find this information helpful? Feel free to leave a comment below or share it. Keep up to date with new posts by subscribing to my free newsletter (and grab your complimentary eBooks). I am trying to make the upright pallet flower garden but it seems way too heavy. Any ideas? Cathy, by the time you fill it with soil, water and plants, the pallet planter WILL be heavy! If you want to secure it to a wall, balcony or fence, brackets or star pickets are a good option. There are many other solutions but it’s a good idea because you don’t want it to fall on anyone. I secured mine with metal stakes. See my DIY Pallet Planter tutorial. We have a interlocking block wall at the end of our garden. We planted some climber plant. It looks like a great fence! Very nice! That’s fantastic news Andrea – congratulations! I’m sure it’s well deserved and no doubt the novelty and practical design caught their attention. 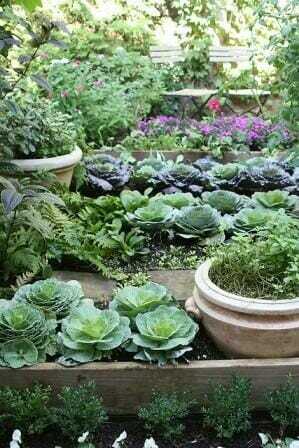 The pallet planter idea is definitely a winner. Email me some photos – I may just have to write another post on vertical gardens … been collecting a few more photos here and there including a horizontal pallet planter!